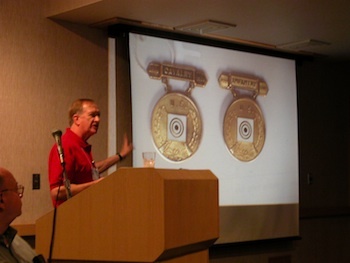 OMSA Educational Seminars are an integral part of the OMSA Convention experience to encourage the sharing and transfer of knowledge regarding worldwide orders, medals and decorations. It is also a great chance to see and hear about seldom seen and rare material. So if you have never been to a convention, you have missed leading experts talk about a wide variety of topics such as Life Saving Medals, Purple Hearts, Hanoverian Guelphic Orders, and Distinguished Flying Crosses. The U.S. Seminar Program is scheduled for Thursday night at 8:15 PM after the ‘Welcome Reception’ and is hosted by Adam Rohloff, the U.S. Seminar Chairman. The British & Commonwealth Seminar Program is scheduled for Friday evening at 6 PM, immediately after the bourse closes, and is hosted by John Allgood, the British & Commonwealth Seminar Chairman. The International Seminar Program is scheduled for Friday afternoon at 2 PM and is hosted by E. J. Fischer, the International Seminar Chairman. Interested in Giving a Seminar? All OMSA Convention educational seminars are given by OMSA volunteer members who wish to share their knowledge and their collections with others. The benefits of giving a seminar range from the satisfaction of helping others to building your network of friends and contacts, especially with those sharing a common collecting interest. Should you be interested in giving a seminar in the future, please contact Nathan Weiss, OMSA Convention Overall Seminar Chairman or any of the above names above to discuss it further. They will gladly assist and guide you in making it an experience you will not regret.